I live near Lake Michigan. I am among the lucky ones, as is my neighbor, Tom Shaver, who has said more than once that he pinches himself as a reminder not to take living next to Lake Michigan for granted. Like most of my neighbors, Tom has a deep appreciation for the awesome grandeur and natural majesty of Lake Michigan; its morning brilliance, stunning sunsets, ever-changing moods, and the sounds and fury of its winds and storms. I savor the opportunity to introduce strangers to the Great Lakes – folks from outside the Midwest or from other countries who have never had occasion to experience the Lakes up close. They are invariably impressed, if not astonished. “How come I can’t see the other side?” is a common question. “You mean there is no salt?” asked an exchange student from Montenegro. We are so fortunate as Michiganders to live in the heart of these extraordinary fresh water seas. The Lakes are a phenomenal geologic anomaly and a magnificent natural endowment. Sculpted by ancient retreating glaciers that left the largest interconnected body of fresh surface water in the world, the Great Lakes are globally unique. Harboring 84 percent of all fresh surface water in North America, the Lakes provide direct health, economic, environmental and ecological services to 40 million people. 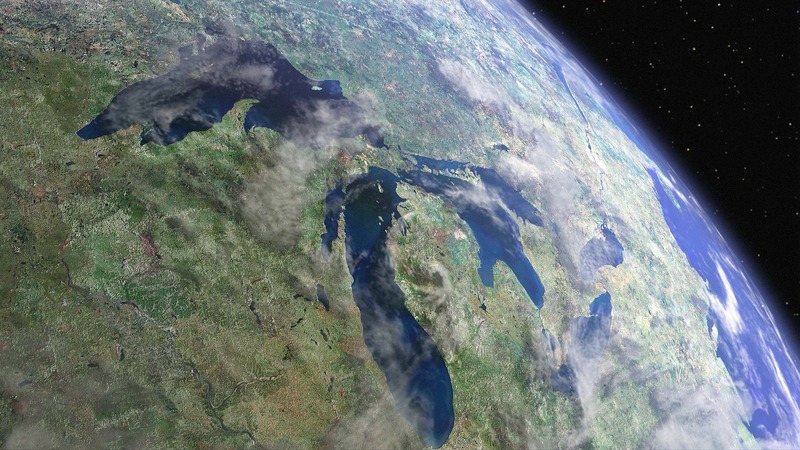 As science measures the lifecycles of freshwater bodies, the waters of the Great Lakes are largely considered both young and pristine, but the geologic timeline only obscures the many immediate challenges facing the Great Lakes. The Lakes’ complex, dynamic ecosystems endure a growing list of human impacts. Nutrient loadings from industrial farming propagate algae, stormwater overflows discharge human waste, and elevated water temperatures transform ecosystems – all injurious impacts exacerbated by climate change. New science reveals that fish and other aquatic life are affected by recently discovered, yet ubiquitous, pharmaceutical chemicals and microplastics still concentrating in our waters. Invasive species, shoreline development, and non-point source pollution present intractable, long-term challenges. Commodification and privatization of the waters of the Great Lakes present serious future risks. The threats to the Great Lakes are manifold, diverse and systemic. Meeting these threats requires concerted action by informed citizens and responsible government operating with common purpose and employing common strategies. It requires citizens and government policy-makers who understand that the Great Lakes – their waters, bottomlands and shorelines – belong to all of us, and that government has a clear legal duty to protect and preserve the Great Lakes for the benefit of the citizens they serve. Government has a “solemn and perpetual” fiduciary responsibility to protect and preserve the trust for future generations. With public ownership comes special duties of stewardship for both citizens and government – duties that are reciprocal and interdependent: Citizens have the responsibility of protecting and preserving this natural endowment for future generations through vigilance, holding government accountable, and demanding sound policy. Government has a corresponding duty as trustee and fiduciary to ensure that the public’s interest in the Great Lakes is not injured, diminished, or alienated. The Public Trust Doctrine is a foundational principle that has long informed the development of our environmental laws. It is also a paradigm that can and should be extended to imminent societal challenges like water scarcity and climate change. FLOW’s unique contribution is to use the Public Trust Doctrine to cultivate principles of good stewardship by increasing public awareness and knowledge of the Great Lakes, by nourishing the mutual inclination of citizens and government to protect the waters of the Great Lakes, and by undertaking strategic actions based upon the doctrine to advance model policies that yield real world solutions. Protecting and preserving the integrity of our water resources is our common bond and shared responsibility to future generations. A beautiful piece on the Great Lakes and FLOW’s mission by FLOW Chair Skip Pruss. He describes how the advance of the stewardship principles of the public trust doctrine can and will protect the Great Lakes from serious systemic threats in this century. Great way to start off the New Year. Thank you, Skip. As you are aware I have worked with FLOW, as well as other environmental organizations, for the last 5-6 years, since “retiring” from as an engineering manager from a major corporation. Your comments are “right on”. Well said. I have frequently shared my engineering and scientific analysis of the issues facing the Lakes with FLOW, and I will continue to do so. I want my grand kids, and their grand kids to enjoy the Lakes as I have. We are proud to continue to support the work of this great organization. Thank you! This is a wonderful article. I will share with several others. Thanks for all you do to protect the Great Lakes.